Cement Tile Adhesives | CMI Marketing Sdn. Bhd. 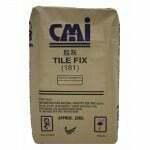 CMI TILEFIX GREY 181 is a high quality polymer modified water—resistant cement-based adhesive for use in fixing of ceramic wall and floor tiles. It is suitable for interior and exterior use in thin or medium bed applications ( 3 mm to 6 mm ). 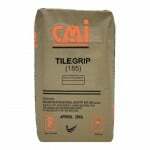 CMI TILEGRIP 185 is a high quality polymer modified water-resistant cement-based adhesive for use in fixing of ceramic wall and floor tiles. It is suitable for interior and exterior use in thin or medium bed applications ( 3 mm to 6 mm ). 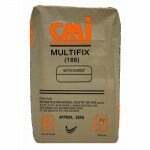 CMI MULTIFIX 188 is a high quality polymer modified water-resistant cement-based adhesive for use as a key coat (spatter dash) for plastering on smooth concrete surfaces and for use in laying ALC blocks and fixing of ceramic floor & wall tiles. It is suitable for interior and exterior use in thin or medium bed applications ( 3 mm to 6 mm).